When going through the home buying process, you will find yourself in a position to choose various companies to work with, one of the most important being a title company to handle your transaction. You will be handing over personal information such as your social security number and financial and banking information, yet only a little over half of the title companies out there that you can choose from have protection against a cyber-attack in place. Most of the information we provide is submitted online, which although is commonplace in this day and age, it puts you at a greater risk. With such important data being handed over, it is important to determine the safeguards these companies have in place and if they are insured against cyber-attacks. If a company’s network is compromised, whether it be from a virus, stolen data from an employee, or a breach from a hacker, the results could be devastating. Loss of finances, data corruption, and other expenses that could come up do to a cyber-attack are not covered by a typical business insurance policy. 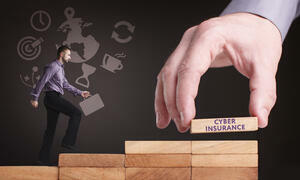 Cyber Insurance is available to cover loss of income from a virus or data breach, damages caused by viruses, loss caused by human error and cyber criminals, and extortion expenses. An investigation by a third party to determine what exactly occurred, and a plan to determine how to fix the damage as well as prevent it from happening again. The investigation is often completed by a private security company, and depending on the institution and cyber-crime, might include assistance by the FBI. It may be surprising to many that a large percentage of small business are not adequately protected against cyber-attacks. Not only do they not have the proper cyber security in place, many naively believe that smaller businesses are not often at risk. However, any company that holds sensitive information is vulnerable, putting themselves and consumers at risk. Research has concluded that many data breaches occur at companies with less than 250 employees, proving it is not just large companies that are targeted. As a consumer, if is your right to ask the companies you are considering doing business with what the cyber security consists of and if they have Cyber Insurance. Keep in mind that if they are covered, your transaction is also.